Having been inspired by the afore-mentioned maxim of Swami Vivekananda, an Indian Hindu monk who was a chief disciple of the 19th-century Indian mystic Ramakrishna, the grief-stricken soul of the benevolent Zaminder of this locality Sri Biswambhar Dinda wanted to perpetuate the memory of his only son ‘PRABHAT KUMAR’, whose premature death left him wretched and broken-hearted, through the establishment of a college to be named after his son. Consequently, our Prabhat Kumar College, Contai came into being on 15th July, 1926 with a princely donation from the broken-hearted father, and soon after the august visit of Bapuji to Contai in early1926. 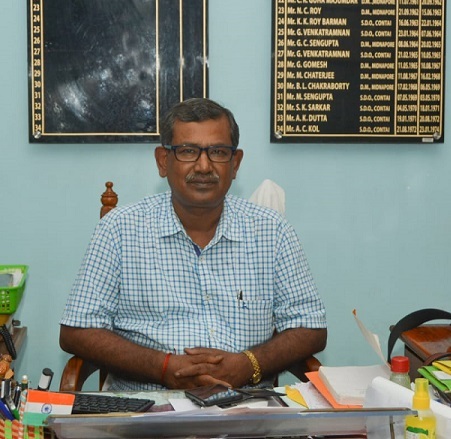 Initially, the college began its pilgrimage with only 39 pupils in the building complex of Contai High School, the oldest H. S. School of Purba Medinipur District as an Arts College under University of Calcutta. After 10 years passage of the college, founder Principal Nepal Chandra Roy purchased a plot of land of about 5.7 acre with a moderate Building from the American Baptist Bengal-Mission at a very moderate price of Rs.3700.00, and the college was shifted on 26th August 1937 to its present location. After the death of Biswambhar Dinda, a trust formed after his name “The Biswambhar Dinda Trust (B. D. Trust) built up “Biswambhar Hall”, the first construction made for the college. Subsequently, about 50 Bighas of land either by purchase or by acquisition came into the possession of the college authority. With the rotating passage of the wheel of time the college has evolved itself and developed as a full-fledged multi-disciplinary Co-Ed college with roll strength of about 7000 students. This magnanimous evolution is the fruit of cumulative factors comprising of the infrastructure, teaching pedagogy, managerial discipline, unshakable spirit of the faculty members for the cause of education, the untiring endeavors of its staff members, and other stakeholders who have showered their abiding love for the college. Hence, at the outset of my message how can forget to extend my heartfelt thanks to good and gracious selves of all the stakeholders of the institution. I fervently look forward to contribute to all stakeholders of the institution through excellence in education and research and to serve as a priceless resource for society; and remain a source of pride for all concerned.